In this illustrated book for children, a brother and sister discover a special exhibit of magical beasts. Mary and her little brother, Tim, are excited about their school’s field trip to the zoo. For the first time since their parents died, Tim is smiling; he’s hoping to see a dragon, although a friend informs him that dragons are only giant alligators. But alligators are interesting too, and Mary promises her sibling that he’ll see some. Then they find that the alligator tank is closed for repairs. Tim cries, but just then, a tall, strangely dressed man appears and introduces himself as Zitthoona, a magus and Keeper of the Phantastic Zoo. “Would you like to see a Dragon, Tim?” he asks. Playing his flute, the Keeper leads the kids through a hidden entrance. Giant plants, music, colors, and mysterious sensations surround them as they meet first a phoenix, then a mermaid, and then—most thrilling of all—an actual dragon. Each creature has a story to tell and a message for the kids about music, imagination, and protecting the environment. Back at home with their aunt Peggy, the children find a tree that becomes their special place to listen to “music magic.” The text urges readers to email the author for a coupon to download an accompanying digital audio album. Kaufman (The Adventures of Squiggle T. Buglet in the Musical Forest, 2014, etc.) 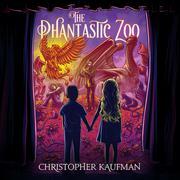 gives children a fantastical experience with his collection of magical creatures who live in a place that’s more like a hotel than a zoo, the Keeper explains. The author presents it all in heightened language that helps build a sense of awe: “The air turned hot and cold as you walked…and in the darkness you could sense ancient powers…and things it was impossible for Mary and Tim to put words to.” The siblings’ affection for each other is sweetly depicted, as well. Kaufman’s faux naïve illustrations have the colorful, flat feeling of pale Matisse paintings, emphasizing the narrative’s air of strange adventure. However, the book’s punctuation becomes distracting with its many ellipses and exclamation points, random capitalization, and sometimes-missing commas. A warmhearted, encouraging book about the wonders of imagination.